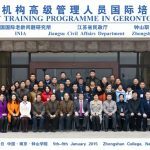 The first ‘in-situ’ training programme for 2015 was held in collaboration with Jiangsu Civil Affairs Department and Zhongshan College, Nanjing, China. 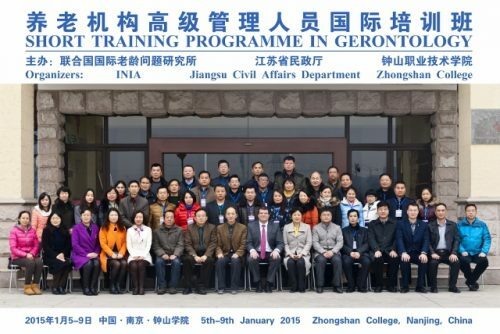 The ‘in-situ’ programme on ‘Gerontology’ was held between 5th – 9th January 2015. Forty participants, all professionals in the field of ageing from Nanking and also from the neighbouring cities in the Jiangsu Province participated in the programme. The lectures were translated into Mandarin and published into a monograph. This proved to be of great benefit so as to ensure greater participation and involvement of all those who attended. Lecturing on the programme were INIA’s Director Dr. Marvin Formosa, Professor Du Peng who is a Member of INIA’s International Board and Professor Gerald Koh, member of the International Editorial Board of INIA’s on-line Journal.